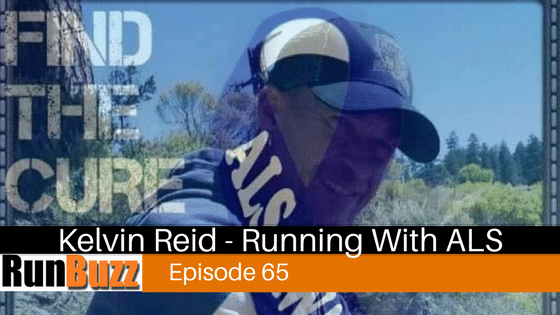 In today’s episode, I am joined by guest Kelvin Reid, a RunBuzz community member and ultrarunner, known as the Ultra Cowboy. Kelvin has completed five 100 miles races in the last two years. In June 2016, while running the Mohican 100 race in Ohio, Kelvin fell and hit his head hard. After that his fingers and right hand started to lose strength and he started to lose muscle mass in his right arm. Next, he started to slur his speech and had problems swallowing. After four different doctors and multiple tests Kelvin was diagnosed with ALS or Lou Gehrig’s Disease. Despite the disease, Kelvin’s attitude and persistence in fighting ALS is nothing short of inspiring. Kelvin continues to run daily while he seeks treatment to prolong, or even save his life. He also shares several running tips he learned as a runner. To help Kelvin, please consider donating to his GoFundMe account. His running background and how he got into ultrarunning. The transition from the marathon to the 50k, 50 miler, and 100 miler is more about being relaxed and finishing than time. The onset of his ALS symptoms that he originally thought was due to a fall during his Mohican race during his race that ultimately was diagnosed as not race related but ALS. How people do not realize how sick he really is because he still is able to run. How he hopes people will help donate to his medical relief fund to cover expenses not covered by insurance. His upcoming trip to Bangkok Thailand, for stem cell treatment which was covered partly by a charity in the hopes that it will slow down the onset of disease. It is not a cure but can help prolong his life. I hope you enjoyed this episode of the RunBuzz podcast.